THE FIRST MACHINE to attempt to take off at Rheims was Guffroy’s scarlet monoplane. It failed to rise, however, because the wheels stuck in the mud formed by heavy rain which had fallen on the preceding day. Guffroy made another attempt on the third day but was unsuccessful. WITH so much accomplished in the air, with amazing altitude and endurance records established and with the sound of an aero engine a familiar sound overhead, it is easy to forget the all-important days of pioneering. Air meetings and air displays are common enough today, but they began in the far-off days of 1909, on the Plain of Betheny, in the Champagne district of France, when thousands of eager spectators flocked to see the first great display of flying. The significance of the Rheims Air Meeting seems unimportant now, yet this meeting marked one of the most important stages in the history of aviation. Rheims was the cradle of competitive aviation. At the beginning of 1909 heavier-than-air flight was five years old. A little over two years had passed since Alberto Santos-Dumont made the first flight in Europe, and French pioneers were hard at work following in his footsteps. The year 1909 was to be a year of great progress and the men who assembled at Rheims were to play a valuable part in the establishment of aviation. In England Cody made history when, on February 22, after many weary months of trial and experiment, he made the first flight of any duration in England, at Laffan’s Plain, Hampshire. By June, many of the hundreds who had been sceptical at the idea of flight were hurrying to see their first aeroplane. July 1909 saw even greater enthusiasm. It was in every way a memorable month in a memorable year. From France, apart from the conquering of the English Channel by Bleriot, came the height record set up by Louis Paulhan, who flew for 57 minutes at Douai and reached an altitude of over 400 feet; and Henri Farman, flying at Mourmelons, stayed in the air for an hour and twenty-three minutes. In England Cody made a flight of more than four miles at Farnborough, Hampshire, circling high over trees and houses, and A. V. Roe flew some 300 yards on his triplane with a 9 horse-power motor. 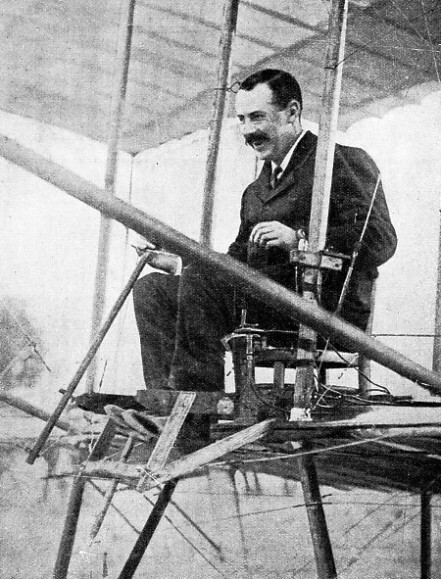 In America, Glenn Curtiss made a flight of 67½ minutes at Morris Park, New York. Such was the position half way through 1909; and the world, still recovering from its scepticism at the idea of human flight, could scarcely keep pace with the news. Then, to cap everything, it was announced from France that a huge aviation meeting was being planned. No country has done more for aviation than France, and in the early days the big lead which she attained was due solely to the encouragement she gave her pioneers. The Rheims meeting was a typical gesture. Nothing was to be spared to make it an unqualified success. The business concerns of the Champagne district responded magnificently to the request for financial support. Prize money totalling about £8,000 was offered, and the meeting was fixed to last a week - from August 22 - and was open to competitors from all parts of the world. After the announcement came the first details of this momentous undertaking. There were to be prizes for speed, altitude, passenger carrying and distance; even airships were to be encouraged, for a prize of £400 was offered for the dirigible balloon putting up the fastest time over a course of thirty-three miles. By the end of July the quiet Plain of Betheny was full of activity. Provision had been made for at least fourteen hangars to house visiting aircraft, and already six of them were completed. Poles and scaffolding towered up from the ground as the grandstand took shape, and long lengths of wooden paling were unrolled. “Ten entries have already been received”, announced the French papers. A few days later, however, the list had increased to twenty, representing no fewer than five nations. Day by day fresh applications were received, until some forty aircraft were entered, to be flown by more than thirty aeronauts. The original hangar accommodation was hopelessly inadequate, and. the officials increased the number of hangars to thirty-five. Ambitious as the original plan had been, it was as nothing to what was promised as the great day dawned. Special telephone facilities were arranged for the Press. The French Postal Service ran telephone wires to the flying ground, linking it direct with Paris, London, Berlin and Brussels; in addition, ten lines connected with Rheims itself. Thousands of seats were set up in the enclosures, at prices from 25s. for the week, and boxes were built to hold up to nine spectators. The price of these was £40 for the whole meeting. All this was for a new sport. A few months earlier no aeroplane flight had been officially recognized in Great Britain. A few weeks before there were barely sixty flying machines in the world. The prize list for the main events was certainly impressive enough to attract people from near and far and, but for a shrewd clause in the conditions of entry, it would undoubtedly have attracted many hundreds of entrants whose machines had no hope - other than in the minds of their creators - of leaving the ground. Rheims, however, was to be a flying meeting, not a parade of freaks, so a deposit of 1,000 francs (then £40) was required for each machine entered. This sum was forfeit should the machine not cross the starting line in the allotted time. For the longest flights made. Prizes £2,000, £1,000, £400, £200, £200, £200. For the machine putting up the fastest time over two circuits of the 10-kilometre course (a total distance of about 12J miles). The trophy, valued at £500, to go to the club of the winning pilot, and the pilot to receive £1,000. For the fastest flight over three circuits (about 18½ miles). Prizes £400, £200, £120 and £80. For the greatest height above a minimum 160 feet. £400. For the machine carrying the greatest number of passengers over one circuit. £400. For the fastest speed over one circuit. £280 and £120. For the dirigible balloon putting up the fastest time over five circuits. £400. Each country sending an aviator to compete for the Gordon-Bennett Cup did so through its Aero Club. Glenn Curtiss, one of the first Americans to fly in the years following the Wrights’ success (see the chapter “Romance of the Wright Brothers” on pages 393-396), and certainly one of the most prominent and promising pioneers across the Atlantic, was chosen to represent his country at the great meeting. When Curtiss did arrive, time was so short that he was forced to take his aeroplane on the train with him to Rheims as personal luggage. But everybody in France, including the guard of the train and other railway officials, was eager and ready to help towards the success of the meeting. Rheims itself was full to overcrowding as the meeting opened. Every room and almost every bed were occupied. Hundreds of visitors were unable to find accommodation, and hundreds more, who were unable to pay the prices demanded, overflowed into the roads leading from the town. The road to Betheny Plain was lined with tents and shelters, housing cheerful people who were ready to brave any discomfort to see the wonders which the coming week promised; and discomforts they had in plenty. The meeting opened on Sunday, August 22, 1909, but on Saturday 21 rain fell heavily. The Plain of Betheny, the road to it and all the public enclosures in it were a clinging, sticky morass. The wind, too, seemed determined to put another obstacle in the way of a successful meeting. But it took more than wind, rain and mud to stop the eager thousands who had been waiting for weeks for the great event. They flocked to the Plain by road, track, and across the fields. They came on bicycle, horseback, in motor cars and on foot. Lining the road to the Plain, apart from the many tents and shelters, were scores of posters advertising motor spirit, or different brands of food, but mainly motor tyres; and a favourite inducement shown was “such-and-such an airship uses our fabric”. A slight climb up the muddy road, and then, suddenly, as one topped the rise, the green Plain of Betheny spread away below, dotted with hundreds of spectators converging on the newly built wooden structures from all points of the compass. Flying was timed to begin at ten a.m., but the weather conspired against it, and it was not until late in the morning that the first machine left the ground. The first pilot out was M. Guffroy, in a bright scarlet monoplane. He was cheered to the echo as he sat, waving, in the cockpit. The engine was started, and the cheering increased. The monoplane refused to budge, however; its wheels were stuck fast in the clinging mud, and nothing would move them. In the end, Guffroy failed to rise into the air within the allotted quarter of an hour, and his machine was towed ignominiously back to its shed, amid good-natured cheers. Scarcely had the doors of the shed been closed when a new burst of cheering greeted the appearance of another machine. It was Louis Bleriot himself, the hero of the great Channel flight. He raised his hand in greeting and the cheers were redoubled. When his engine started and the big monoplane moved across the ground, and lifted into the air, the crowd went nearly hysterical with joyous anticipation. Bleriot’s triumph was a short one, however. Some grit found its way into the carburettor of his engine and he came down, having made only a third of one circuit of the course. One of the most interested men at that moment was Glenn Curtiss. He leant up against the side of his shed, deep in thought. He had said little or nothing about the new engine he had designed - for a good reason. Yet there, in the nose of Bleriot’s big monoplane, was a new eight-cylinder motor, capable of yielding eighty horse-power. Somehow the news had leaked out. The Frenchman had heard of Glenn Curtiss’s plan and had sought to beat him at his own game. While Bleriot and his mechanics worked on the obstinate engine, fresh cheering announced another aviator. This time it was the ever-popular but unlucky Latham, who had suffered the most miserable luck in his attempts to fly the English Channel, and who might have been the first man to cross the Channel in an aeroplane. Bad luck seemed to dog him. And now, many people noticed with a mixture of amusement and misgiving, the number 13 was painted boldly on his graceful Antoinette monoplane. If Latham was superstitious, he did not show it in any way. He opened the throttle and took the air almost immediately. A few minutes later his engine spluttered and, like Bleriot, he was forced to land. 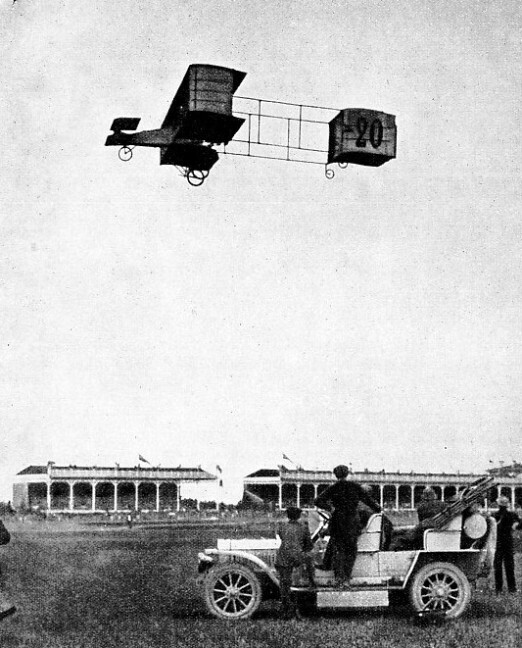 The next competitor, Captain Ferber, who flew under the name De Rue, could not even get his Voisin biplane from the ground. It remained for a new, self-taught pilot, M. Lefebvre, to make the best flight of the morning. His machine was an American Wright biplane, and he made a complete circuit of the 10-kilometres course in about nine minutes. These flights were intended as the preliminary efforts for one of the main events of the meeting, the Gordon-Bennett Cup; from them the French officials had to choose their representatives, and 3 p.m. was zero hour. When the committee met, therefore, they had a fairly easy task. Bleriot and Lefebvre were chosen, much to the disappointment of the gallant Latham, whose flight was adjudged to have been too short. The meeting seemed to be the signal for more rain, which continued until about half-past five, drenching ground and spectators alike. But the spectators saw it out and waited on. They were well rewarded. Latham took the air amid a roar of cheers and flew away down the course. He was followed almost at once by the Comte de Lambert, and within the next hour Sommer, Cockburn (Great Britain’s only representative), and eight other aviators all made flights. At one time there were seven machines in the air at once, and the patient crowd forgot all discomforts, cheering each aviator as he flew past the stand and enclosures. THE BEST FLIGHT on the first morning of the meeting was made by Lefebvre in a Wright biplane. He completed a circuit of the course (about six and a quarter miles) in nine minutes. 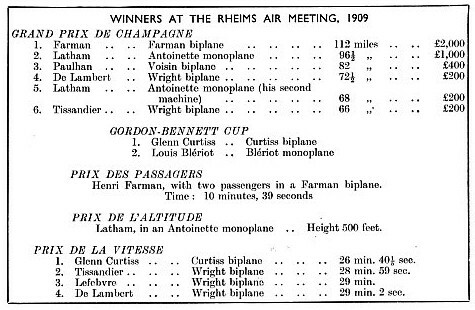 Because of this flight he was chosen as one of two fliers to represent France in the Gordon-Bennett Cup race. Bleriot was the other aviator chosen. The second day, Monday, August 23, dawned as bleak as had the preceding one, and there was no flying at all during the morning. An unexpected attraction, however, more than satisfied the thousands of spectators who had trekked out to the plain. Moving steadily against the wind, barely 200 feet above their heads, came the French airship Colonel Renard. She had flown from Paris with three passengers, and she circled about over the course for some time before turning away in the direction of her shed, between Rheims and Chalons. The weather improved after lunch, and the trials for the Grand Prix de Champagne were held. First in the field was Delagrange in a Bleriot monoplane. At first it was thought that the mud would be too much for him, but at the second attempt he got clear and flew for about six minutes at a height of 50 feet. Five minutes later the young aviator Bunau-Varilla followed in a Voisin biplane. Unfortunately, a sudden squall overtook him, and he landed as fast as he could, but either not quickly enough or too quickly. Not much damage was done, however, and the machine was soon brought back to its shed. Twenty minutes after this excitement, Paulhan, fast winning fame and popularity, took the air in his Voisin; and he stayed up for thirty minutes. Spurred on by this achievement, several others tried to emulate him, but they were unable to get clear of the ground. Fournier succeeded in rising, but he came down almost at once, on his side. The machine was badly damaged but he was unhurt. Shortly after 6 o’clock that evening Bleriot went up in a machine of the type in which he flew the Channel, and he flew the 10-kilometres course in 8 minutes 42 2/5 seconds, thus creating a new world speed record of 42·87 miles an hour. Like the first and second days, the third day broke to the accompaniment of rain and wind. Little or no flying was possible in the morning, but towards noon the sky cleared, and the aviators began to wheel out their machines. Guffroy was first, with his bright scarlet monoplane; but it seemed to prefer the mud to the air, and for the second time it stuck fast. Paulhan then went up in a Voisin in an attempt to better his time for the Grand Prix de Champagne. He was scarcely in the air when Latham followed him, climbing rapidly, as was his custom. After him came Fournier on a fresh machine, and for a few minutes the three of them circled round the course. Then, suddenly, Fournier was missed. There were only two machines in the air. For some time there were fears for his safety, and then, to a wave of cheering, a horse-back rider was seen approaching. It was Fournier, slightly shaken and bruised, but otherwise cheerful and unhurt. A sudden gust of wind had caught his machine and hurled it to the ground on its side. Five o’clock was the closing time for the trials, and Latham came down just in time to change his machine for another attempt. Paulhan was still in the air, flying low and steadily. Once more Latham took off, climbing as he went, but two circuits saw him down again. His bad luck was holding. Though his time on the first day was good, he had hoped to add to it. Now, with Paulhan ticking off the laps, the position was becoming acute. Twilight came, and still Paulhan flew on. Finally he came down after having completed thirteen laps, a distance of 82 miles in 163 minutes. The day was not done, however. His descent was the signal for general activity, and nine machines rose into the darkening sky, including those of Curtiss, Bleriot, Voisin and Henri Farman in one of his own biplanes. The crowd once more had their money’s worth in a sudden and unexpected display which left them speechless after surge upon surge of cheers. The following day began badly but improved. Several aviators put in trial flights, and at 2 p.m. Latham took off again, hoping to improve upon Paulhan’s figure of the day before. By 3.28 he had completed ten circuits. The wind rose and dropped. Still Latham kept on, round and round. Finally lack of petrol brought him down, but not before he had completed 96½ miles in 2 hours 13 minutes. Not merely day by day, but hour by hour, fresh world’s records were established at Rheims, before the eager audience of thousands from all over Europe. Many a spectator who had come, disbelieving but interested, and prepared to be mildly entertained, felt a strange excitement stirring in him as the machines roared round above his head. Many a spectator left, after it was all over, determined to take up this new, thrilling sport as soon as he could buy a machine. The close of the fifth day provided an alarming thrill for the thousands who watched from the enclosures. Louis Bleriot took off in his big monoplane, with a passenger, and completed a round of the track. When passing the stand on his return, he tried to turn too sharply, intending to fly back along his own course to the hangars. His machine swung out over the heads of the spectators and headed for the stands. Bleriot saw that he could not pull it round in time and he came down. He landed safely, but at great speed, and the monoplane charged the palings, demolishing some 20 feet of them. Bleriot and his passenger were lucky; so were the people in the crowd. Fortunately they managed to scramble out of the way, and no one was hurt. Two airships appeared on the sixth day, the Colonel Renard and a smaller ship, the Zodiac, and they flew round for some time. Paulhan had an escape in the morning, when he was nearly in collision with Delagrange in his Bleriot machine. Paulhan had fitted a large 25-gallons petrol tank to his machine, hoping to regain his lead over Latham, and had just taken off when he saw the Bleriot bearing down on him. There was no time for a second thought. He brought his machine down again with a bang, smashing the nose and the left wing. A newspaper correspondent wrote that Louis Paulhan thus robbed himself of any chance in the Grand Prix, but achieved the honour of being the first pilot to avert an aerial collision. In the early afternoon, Henri Farman and a few other aviators went up. No one took much notice of Henri Farman at first. So far he had done nothing spectacular. But Rheims was full of surprises. Someone suddenly realized that Farman had been in the air for nearly two hours, and he showed no signs of coming down. Latham’s record was in danger. On and on went Farman round and round the course. It was almost dark when he had completed fifteen laps, but still he kept on. Already all previous records for endurance had been broken. THE ONLY REPRESENTATIVE OF GREAT BRITAIN at the Rheims Meeting was Sommer Cockburn. He flew his aeroplane in the evening of the first day of the meeting, after a spell of heavy rain. A large number of aircraft were flown the same evening, and at one time there were seven in the air together. Glenn Curtiss was a wise man. He remarked that he had seen, during his trial flights, as many as twelve machines down, smashed or disabled. He was determined that his machine should not add to their number. He waited; and he won. On the eighth and last day of the great meeting the sky was blue and cloudless and there was only a breeze instead of a wind. The roads to the plain were black with spectators. It was estimated that altogether from 200,000 to 250,000 people gathered on the Plain of Betheny that day, and there were about 10,000 or 15,000 in the stands. It was a day of excitement and thrills. The lap prize for speed brought out Bleriot in his big 22 monoplane, in which he won the Tour de Piste, flying one circuit in 7 minutes, 47 seconds. petrol tank had burst. This was not the first time he had been involved in a smash of this kind, and he received a great ovation from the crowd for his pluck. It was remembered then that he had flown the Channel wearing carpet slippers, in great pain from burns caused in a previous accident. M. Breguet also had an accident that day, but without serious consequences, and Delagrange’s propeller burst in the air. But the closing sequences of the meeting brought forth further new records. Curtiss beat all records with a speed of nearly fifty-one miles an hour. Latham scored a height record of 500 feet. The chief results of the meeting are shown in the table reproduced above. The achievements at the Rheims meeting cannot be judged by the prizes well won, or by the records set up, now pathetically small compared with the speed, height, and endurance records of to-day. The real result of Rheims was a turn in the tide of aviation. Of the many thousands who went to the plain, not one left without feeling that he had seen history in the making. The years have passed, and Rheims is barely remembered, but for all that it was one of the most important events in the history of flying. 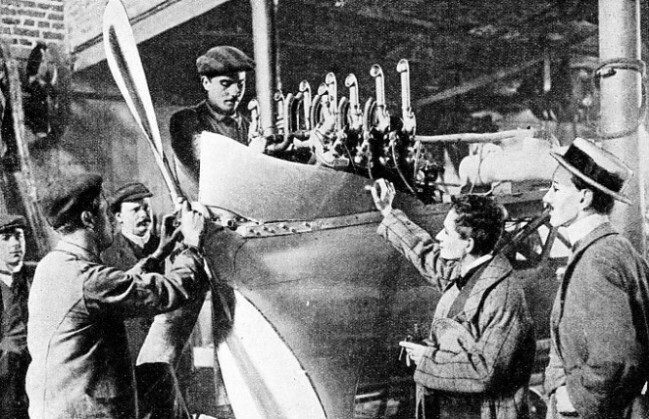 Not only were potential aviators attracted to the meeting, but also many important people who were later to become associated with aviation on the business side. The Rheims Meeting was responsible for an all-round interest in everything to do with aeroplanes. It attracted new pilots, fresh capital, and a wealth of orders for designers who had paraded their goods successfully. Hundreds of air meetings were to follow, in all parts of the world, and the huge crowds that always attended such meetings did more than might have been realized to nurse the new sport through its difficult stages. Financial support was forthcoming as a direct result of the attractions that the venture created, and the prize money offered and won was by no means the greatest of these attractions. Rheims fostered the latent spirit of competition in aeronautical development. More significant than any of these things, however, was the fact that various foreign Governments were sufficiently interested to send representatives. Reports which were brought home from Rheims caused more than one Power to go carefully into the potentialities of aviation. MECHANICS AT WORK ON LATHAM’S MACHINE. The propeller consisted of two flat blades set at an angle and resembled a canoe paddle. Latham gained second place in the event for the greatest distance covered, with 96½ miles. 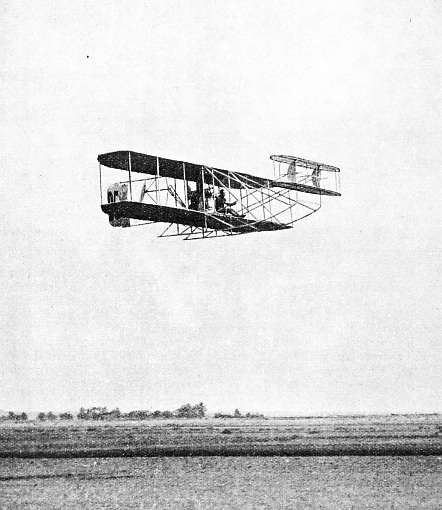 Farman, the winner, flew 112 miles. Latham’s machine was an Antoinette monoplane. This pilot also won the height contest by climbing to 500 feet.